A characteristic legal document in India or perhaps the World over, a “Will” is a document that testifies a person’s intention about distribution of his/her wealth after death. The wealth can include both movable and immovable property. 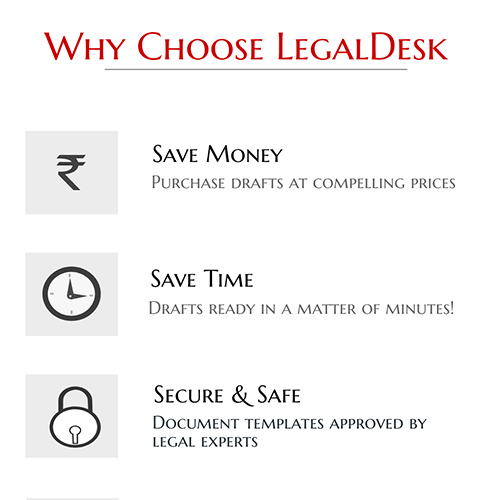 It provides a well laid out succession plan for the legal heirs and ensures hassle free distribution of holdings. A Will needn’t be only for the rich and wealthy nor is it a mandate for aged persons. Anybody who has even a small property, cash or jewellery and wishes to bestow them to the loved ones after death should make a Will. It also helps avoid legal tussle between family members or other associates pertaining to inheritance of wealth as there is a clear cut evidence in the form of a Will that drives effortless inheritance. And also ensures that your property does not get into wrong hands. Before we provide further insight, let’s get you acquainted with the legal terms commonly used in Will writing. You must understand these terms before drafting a document. Will – Also known as the testament, a will is a written document providing details of the wealth the testator wishes to dispose after death. Testator – Person who makes the Will for execution. Testatrix – Is a term used to denote a female Will maker. Beneficiary – As the name suggests, a person or a trust who is bestowed with the asset under the Will by the testator. Executor – Is a person appointed by the testator under the Will to ensure the property is distributed to the beneficiary(ies) in accordance with the conditions and preferences expressed in the document. Witness – Are persons in whose presence the testator signs the Will. The witnesses should be physically present and witness the signing by testator and then provide their signature as a proof. A Will in India requires two witnesses. Codicil – A document that represents any addition, deletion, modification, revocation or exemption of any of the provisions made in the original Will. A Codicil is an insertion to the existing Will. Intestate – A person who dies without leaving a Will is known to have died intestate. Self acquired property- property that is earned by a person’s own efforts or knowledge or other human endeavour and becomes the sole owner of this property. Nobody exercises any right on the same during his lifetime. Ancestral property- A property that is acquired through inheritance from ancestors through many generations and is always shared by members of a coparcenary equally. Minor – A person who has not attained majority(completion of 18 years) as per the Indian Majority Act of 1875. When a minor is the beneficiary in a Will, a guardian has to be appointed who acts on behalf of the minor till the minor reaches the age of 18. The above definitions should be sufficient to learn further. Let’s go..
All that you would like to know about Will Making. In a Nutshell. As briefed earlier, Will is a legal attestation of the testator’s intent to distribute his wealth, both movable and immovable after his death. A clearly laid out document, the Will should contain specific details of the asset he/she wishes to bestow to the beneficiary after death. Anybody can make a Will as long as he/she has attained majority and is of sound mind. A person can make a Will only with respect to his self acquired property and not ancestral property that devolves on him through generations. There is a general misconception about Will making and documentation. It is not as complicated as it looks. In fact, printing and executing is one of the simplest things to do. First of all, a stamp paper is not a mandate for executing a Will. It can be a plain sheet of paper, can be handwritten. It does not require endorsement legally, unless it is in dispute. There are no specific provisions in the legal system that dictates terms on distribution of assets. The testator is at his Will to decide endowments to the beneficiaries. But definitely, it should be signed by the Testator in the presence of at least two witnesses. A thought that may cross your mind often. Do I really need one? Trust us. A Will would be the most sensible document you can own if you’ve good amount of assets and staring at distributing them in a certain manner among the loved ones. This not only helps identify the assets but also ensures hassle free movement to the beneficiaries after death. Let’s discuss a few of the many drawbacks of not having a Will. In case if there is no Will and the person dies, he will die “intestate” which paves way for distribution of assets amongst the family members according to personal succession laws. So if there was no Will made, the assets may not really get distributed as you wished. After your death, there may be a legal battle amongst your heirs towards sharing and control of the wealth. If a person does not have any legal heirs living, the assets would go to the government after death if there was no Will directing its distribution. If there is a liability against the property, absence of Will may lead to unwanted burden on legal heirs. Not as complicated as it sounds, a Will can be an easy to draft document. Its very important that you lay out a clear picture on distribution of assets to the beneficiaries. A Will can be altered anytime by the testator during his lifetime. He can insert codicils. The Will can be revoked only by the testator. Registration of Will is not mandatory and needn’t be on a stamp paper. You don’t have to create any other legal documents in order to make your will. If one or more beneficiaries is a charity organisation, registration is mandatory. To make a will in favor of your family, click the button given at the top or bottom of this page to get started. To make a general elaborate will you can visit our page for making your own will. 1. Who can make a Will? Any citizen of sound mind above 18 years of age can make a Will. The testator(Will maker) should have assets of recognizable value and should not be barred by law from making a Will. 2. I have an elaborate Will in place for my wife and children. Am I allowed to modify the document? As a testator to the Will, you are free to make amendments after the will is made. The document that represents modifications, revocations and exemptions is known as Codicil. This is an exclusive document outside the original Will, attached or inserted to the relevant page. Otherwise you can destroy the present Will and make a fresh one if the changes are too many. 3. What happens if a person dies without making a Will? How are the assets distributed to the heirs? 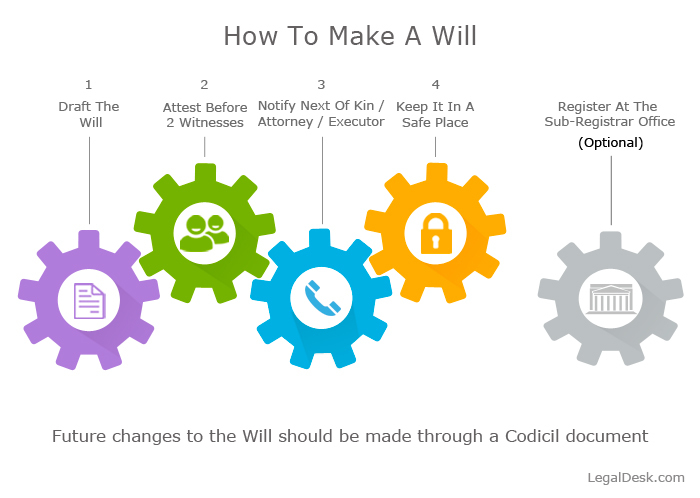 It is always advised that a Will is made when the person is alive which clears the air and avoids any dispute between the legal heirs after death of that person. If there is no Will in place, the wealth is distributed as per personal succession laws of the deceased. 4. Is there a cap on the number and types of assets covered under the Will? There is no limit to the coverage. All movable, immovable assets, Goodwill and intellectual property rights can be covered under the Will. Any self-acquired asset that is owned by the testator before his death can be included under the ambit for distribution to the beneficiaries. Any property that devolves on a person through generations is the ancestral property and that cannot be included in the Will. 5. If I have nominated power of attorney, is the attorney allowed to make amendments to my Will after or before my death? A power of attorney is generally nominated to act on behalf of the grantor only for specific tasks. Will is commonly not a part of this deed. A POA will not be able to make any changes to the Will after your death as it automatically ceases to exist. Only the executor is allowed to administer and ensure distribution of wealth as per the Will. 6. I hold a few assets jointly with my brothers. Can I include these assets in my Will? Yes, you can. Only to the extent of your share or ownership of the said asset(s).